Hello there we hope you’re all happy and well.We’ve probably mentioned before that this year we are 70 years old as a company! To mark this we said we would have 4 birthday parties throughout the year and invite as many of you as we can. The invites were randomly picked from our database and we were honoured to have the company of 24 of you. 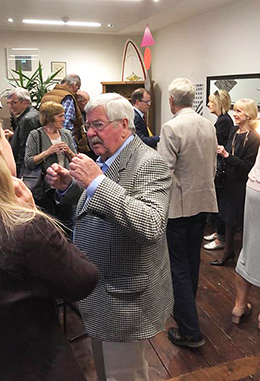 As we’d not long been back from Milan the party had a bit of an Italian theme and Duncan from Vanni (a great Italian eyewear brand) was there to tell us a bit about the company and why they like to deal with Bottomley Opticians. We had some lovely Italian food provided by NOCO who operate just outside our window in the Westgate Arcade and everyone remarked at how tasty it was. John and Sue Bottomley came down for the occasion and John gave us a brief history of Bottomleys and talked about how Randolph set it up in 1948 and the various milestones along the way to us moving from 10 commercial street down to the Old Town Hall where we are today. Chris from Zeiss gave us a bit of an insight into the company and how it works and why they like being involved with Bottomleys. He also announced that as of May this year all Zeiss lenses will have the UV400 Block as standard. Zeiss are the first people to roll this out and have their own special way doing this. The thing that impressed me was the fact that they are not patenting it as they see it as important that all lens manufacturers follow suit. This follows one of Zeiss’s core principles “to make the world a better place”.Later on there was a raffle and entertainment from our very own Andy Greaves and after that we moved the party down to Bottomleys Eyewear Boutique in the Piece Hall where more drinks were waiting and people could see the place before we officially open it on the 1st of May. We were a little apprehensive about doing this event as we’ve never done anything like it before but I have to say I was chuffed to bits with how it all seemed to flow and the positive response we got from the 24 of you who attended. 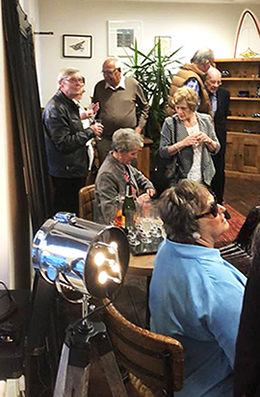 There will be other events like this and if you would like to be at them please send us an email to hello@bottomleyopticians.co.ukand we will put you on the invite list.